Before I get into this, let me throw out definitions, just to ensure that we’re all on the same page. An obstacle hinders of prevents progress, a barrier simply prevents. Let me suggest that there are very few real barriers in life, rather, there are many obstacles and choices that go with them. For example, I had returned to college as a working adult to complete my bachelor’s degree. I got pregnant. Pregnancy was an obstcle to completeing my degree, but I chose to stop attending school because for me personally, working, parenting, and going to school was too much. Another person could have made an entirely different choice and still have been right, just like I made the right choice. But let me be clear, pregnancy was not a barrier, it did not prevent me from completing my degree, it just made the path trickier. I am reluctant to consider a closed door a barrier. (except shouldn’t they just accept it instead of excepting it? Or is this to suggest that you omit it, I guess that works, but still, c’mon man). Let me give an example. In the movie, “The Lion King”, Simba watches his father die, and considers this a “closed door”. He goes off, finds new friends, and lives a “Hakuna Matata” life, which is great. But when he finds out that he’s needed in his old community, he reexamines the situation, and decides to bang down that closed door. While his life with Timon and Pumbaa is cute and fun, you simply don’t have a hero until Simba decides that his closed door is just an obstacle, and obstacles can be overcome. The formula applies in every story that has ever held conflict in which a character becomes a hero. While I admit that stories are fiction, the same applies in real life. Imagine if Walt Disney had taken his his failures as closed doors and decided to become a used car salesman. Or Stephen King? (A personal favorite of mine). Or JK Rowling? The list goes on. 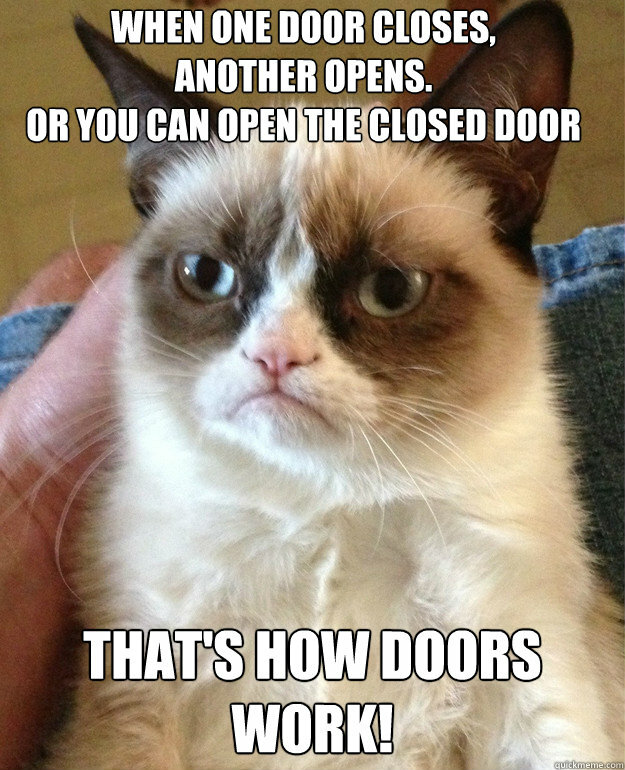 I don’t know about you, but for me, I’m not taking that closed door as a sign that I should just move on. I am a person with discernment and will, and as such, with each closed door, I will decide how to proceed. This doesn’t mean that I won’t walk away from some closed doors, but it does mean that I will never assume a closed door is not meant to be opened, beaten down, or otherwise circumvented. I am a coffee snob. Not a latte or some kind of adulterated coffee, just a really good, smooth, rich cup of regular coffee, and it has to be fresh and hot. My keurig is probably my favorite earthly possession (although it’s in fierce competition with my bed). I use the refillable pod, because landfills are gross, and my two cups a day are a treat of unquantifiable value. From the second I sip my last drop I eagerly anticipate the next morning’s brew (of course after indulging in sleep in my luxurious bed). So here I am, stuck in the hospital with my kid. It’s not exactly a vacation here, the bed is torture, the shower is mediocre, and the cafeteria charged me $10 for soup and a salad (is this not the most outrageous thing ever? I’m stuck here with my kid and a simple, healthy meal is exhorbidant). But all of that I can abide. At least my soup and salad were of good quality and nourishing, it’s the coffee that stirs my ire. I’m sure that not everyone loves their coffee so much that they quote “Song of Solomon” to it in the morning, but I do. I sometimes prepare the pod in the evening so that I can enjoy the aroma in anticipation of our morning love affair, a little java foreplay, if you will. But I’m not about to just drink it for my addiction, oh no. I plan ahead, waiting for the optimal moment in which to sit down with my coffee and enjoy the intimacy of a girl and her brew. So I’m away from home, from my luxiurious mattress, my husband, children and dog. I’m sleeping on a medieval rack, paying out the nose for a light lunch, and cleaning up ungodly volumes of vomit. I can live with all that, but I can’t live without decent coffee. I don’t know who it is who decides how to vend coffee in children’s hospital, but sir or madam, if you happen upon this, please, consider the injustice of that Folger’s abomination in light of my plight. I long to give good care to my sick child, with only one caveat; my coffee. So now to decide how to launch my crusade. Go Fund Me to fund ethically traded, real coffee in every children’s hospital in the U.S., or a Move On petition to mandate that hosptials provide it for us, or possibly just opening a kiosk on each floor here asking only good will offerings. I am not yet sure how I will proceed, so stay tuned, this woman is on a mission. I beg your pardon from the get-go. I’m sleep deprived and tired. Bone tired. I’ve been spinning my wheels all weekend caring for a child who is too sick to accept my care. I hold his hand, he pushes me away, I rub his back, re recoils, I hold a basin to catch the vomit which has been reduced to stomach juices for 2 days and he bats the basin away. I have been on the phone all morning with nurses, and get few answers. 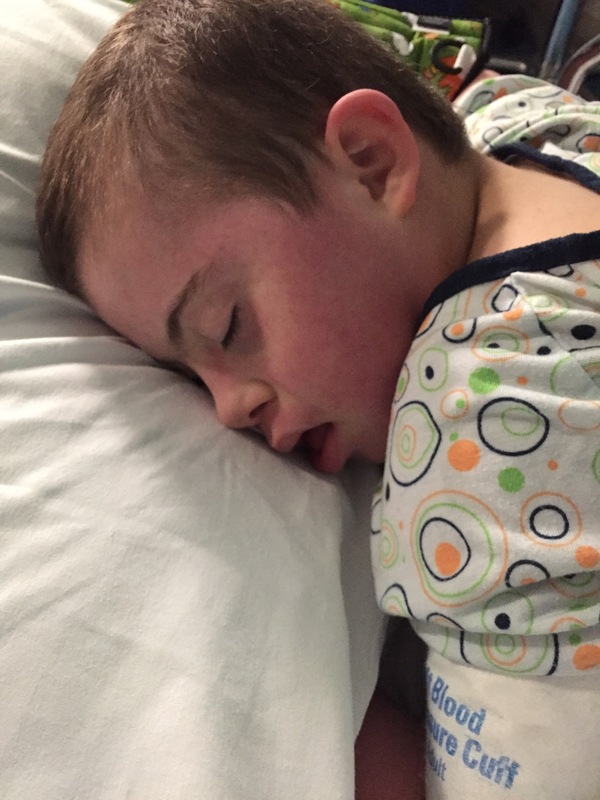 I spent the evening in the ER using trial and error to help him, and return home only to find the help was extremely short lived. Today I’m pulling out the stops to find help only to realize that our only prayer is that his body, an amazing self-righting machine, can find away to gain traction and achieve balance, and if it doesn’t, we resume trial and error. I feel impotent facing his suffering, and so very angry that one human child must endure so much. I am angry that modern medicine can produce marvels beyond our wildest imaginings, and still not grant my child relief. I’m angry that the creative force behind the universe, the alpha and omega, the catalyst behind jellyfish, volcanoes, waterfalls and narwhals has allowed this child to fall through the gaps of all that is right and good in the world and bear so much suffering. I am angry that my other children suffer alongside him, as do so many who love him. I live in a state if cognitive dissonance over the injustice of it all. I am angry that all the energy this lion mama can produce so often results in spinning my wheels, incompetent to be an agent of healing and wholeness for this child, no matter how hard I try. 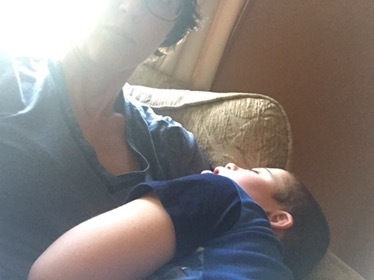 For a moment he sleeps, and I pray, fruitlessly I fear, that the rest will restore him and that he will awaken refreshed, with his internal mechanism reset. Conversely, I pray that if rest doesn’t restore that our doctors will dig deep, finding the root of the problems and long-term solutions for ultimate health and well-being. I still hope, but I doubt.